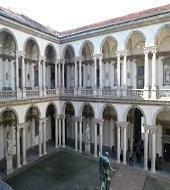 The Brera Picture Gallery is located in the homonymous building in Via Brera 28 in Milan. The Gallery was the first museum in Milan and is one of the most outstanding picture galleries in the world as it houses some of the most prestigious selections of antique and modern picture masterpieces as well as important sculptures by Italian artists of the XXth century. Among the artists: Gentile da Fabriano, Mantegna, Bellini, Tintoretto, Bramantino, Piero della Francesca and Raffaello Sanzio, Caravaggio, Tiepolo, Tintoretto. Closed: Monday, January 1st, May 1st and December 25th. You need to select a timeslot for entrance in the morning or afternoon. An actual timeslot will be given to you after your order.